We didn't have snow but our neighbours still have a snowman. look at that face! What a little poppet. We try not to label Bears behaviour as naughty or not but sometimes it can't be helped. 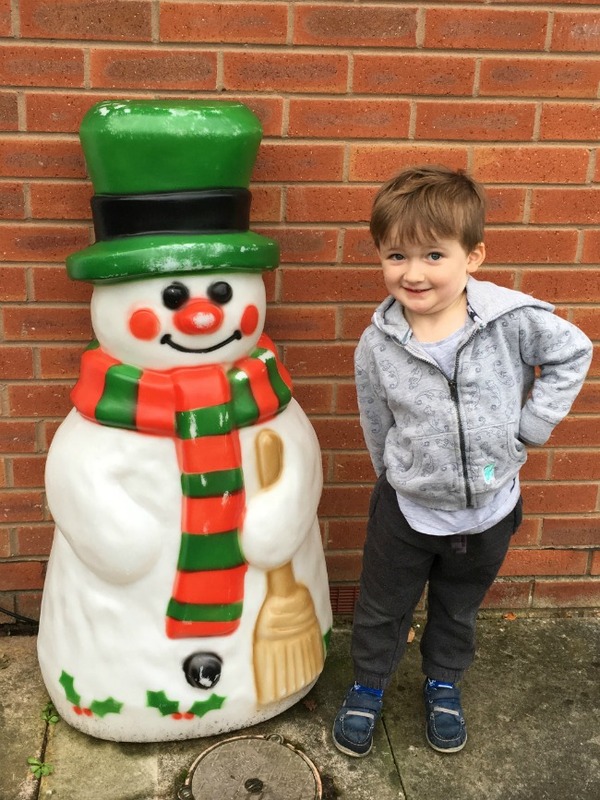 We started the week on Tuesday with a child that is certainly on Father Christmas's nice list. He was wonderful from the minute he arrived until he left. It is lovely to see him well and happy. 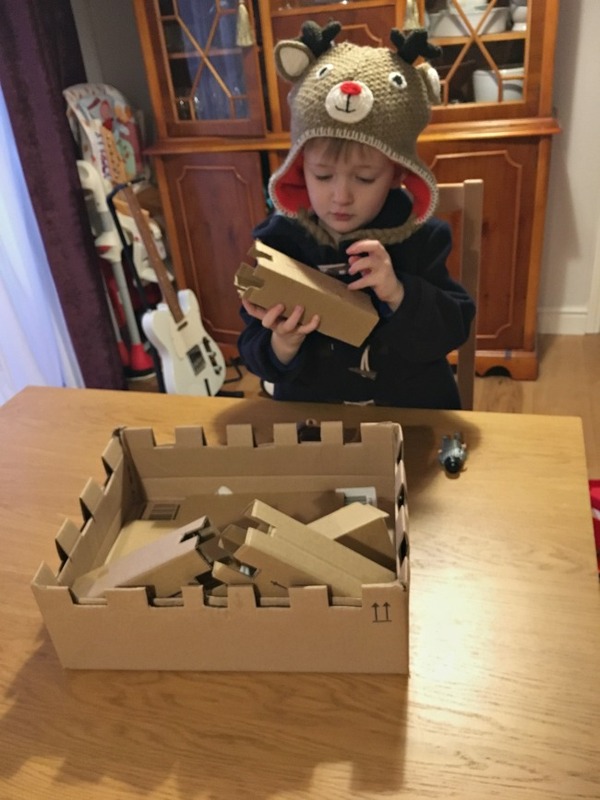 I had made him a castle out of an old cardboard box (how I did it will be on the blog on Wednesday) and as soon as he saw it he was so pleased. He ran and got his box of knights and played for ages with it. There had been snow at the weekend but Tuesday was absolutely freezing and rainy. 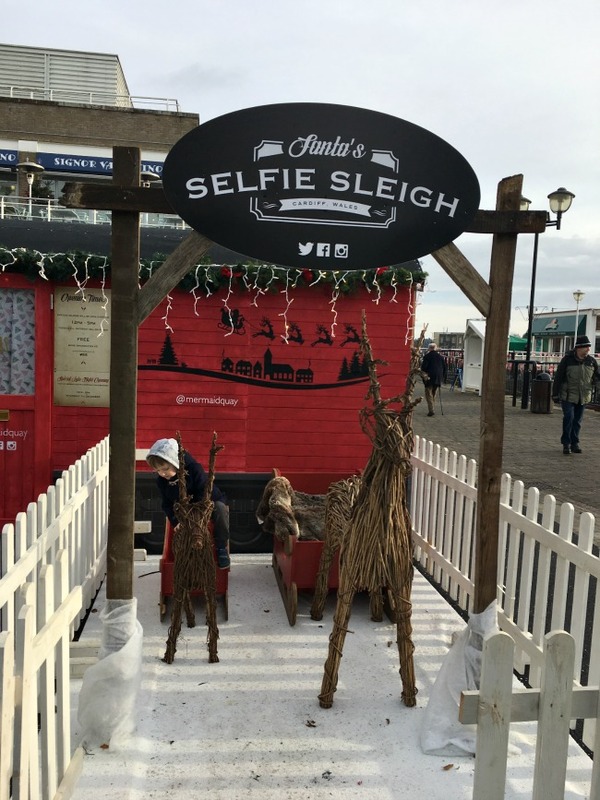 We didn't want to stay in so we thought we'd visit Cardiff Bay where there's lots to see and some is under cover. 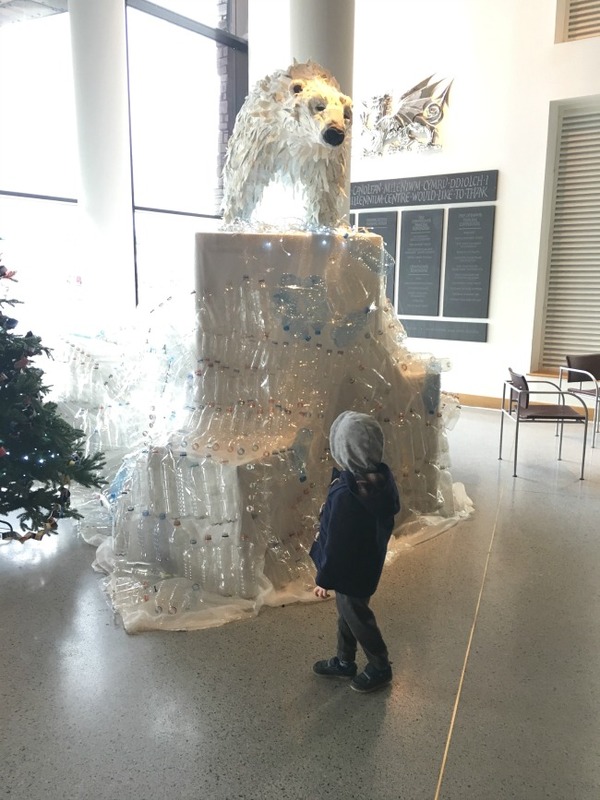 There is a free arctic display in the Millennium Centre so we started there. We then stumbled upon Father Christmas's Post Office. 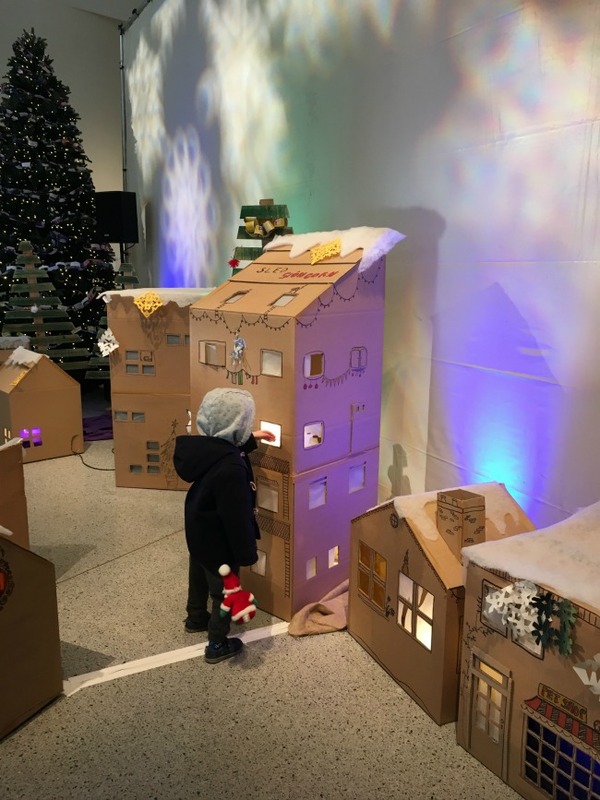 Bear wrote his letter and posted it, I hope Father Christmas is reading it and getting his toy wrapped. Then we went to Bills Restaurant for lunch. This is quickly becoming my favourite place to eat out. The staff are lovely, the food is good and the coffee is fantastic. Bear was perfect, he didn't run around or disturb other diners. He ate his lunch and coloured with the crayons they had given him. 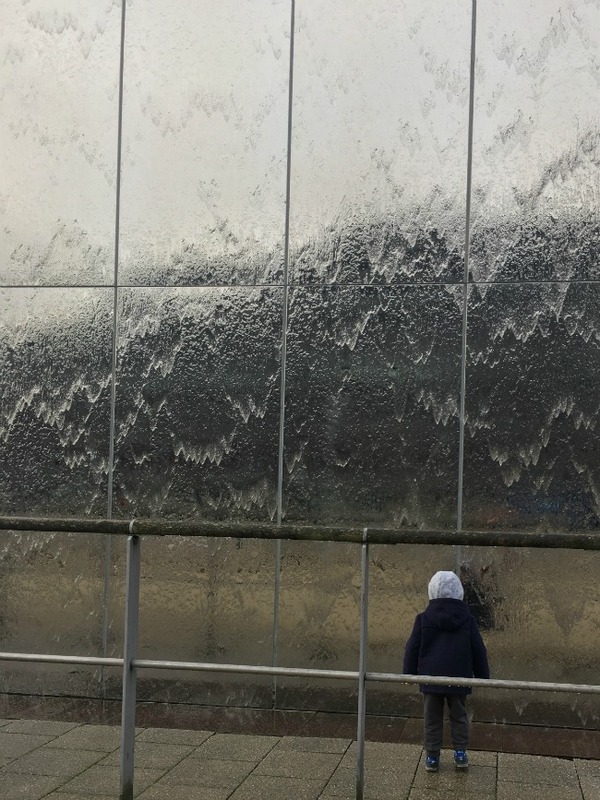 It was so cold that the water was freezing as it fell on the waterfall in Cardiff Bay. Bear loved it. 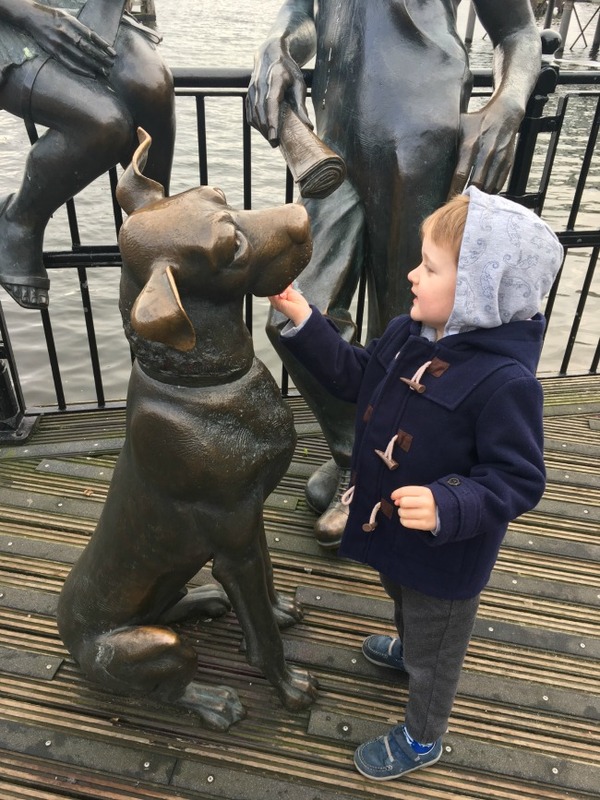 There are statues dotted around Cardiff Bay and this dog is very popular. He is all shiny on his head and nose where he had been petted. 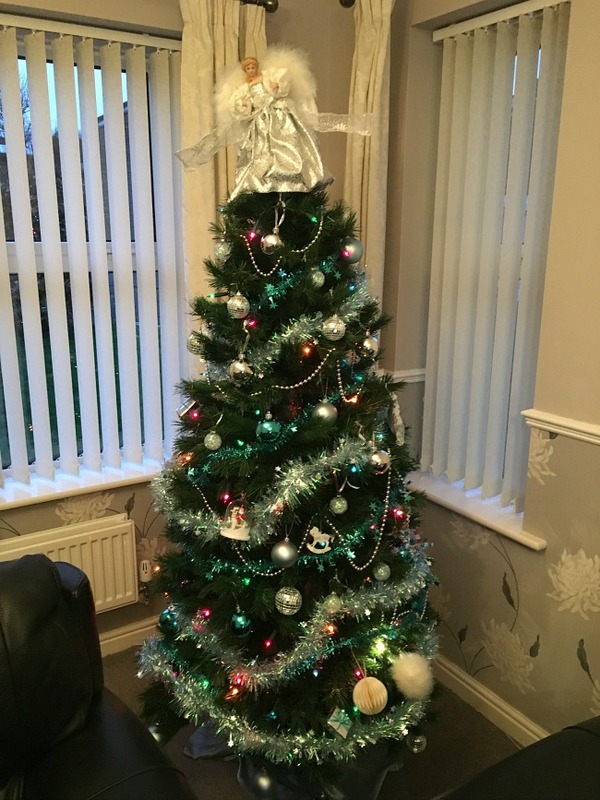 When we got home Bear helped decorate our tree, the angel may be a bit wonky but he did a good job. On Wednesday a different child was brought to us. I sometimes joke that they had twins and some days I get the naughty twin and somedays I get the nice twin. Well today it was the naughty twin. Bear wouldn't eat so he was tired and hangry. He wouldn't get dressed, he didn't want to go to Tots to play. He didn't want to do anything. Everything I did got the response "you are very annoying". It was pouring with rain so we couldn't go out to the park which usually snaps him out of it so we went to Tredegar House. They advertised a Christmas event with putting baubles on the trees and the house would be decorated as a Victorian house. The rain hammered down. The baubles were to be put on the trees outside so we got soaked, not a good start as it was freezing. When we arrived at the house we had to check in our umbrellas, which was fine but almost straight away Bear wanted to go to the toilet, this is through the house and outside so we ran, collected our umbrellas and dashed through the house. We got soaked again. 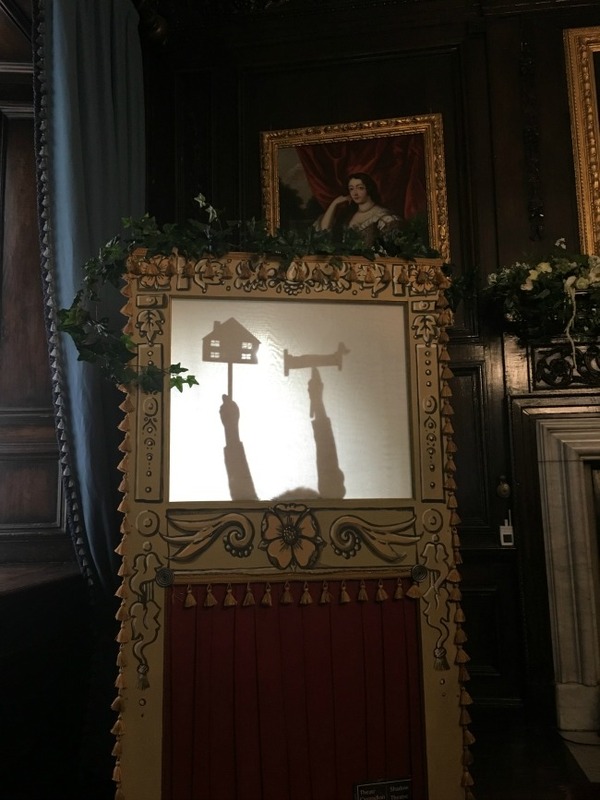 The shadow theatre at Tredegar House. Bear put on a great matinée for me. Back into the house and all I had was "this is boring". I had checked the umbrellas back in and we had got upstairs. Most of the house was closed or roped off so I had to agree with him. The schoolroom was shut and the upstairs rooms were roped off. I was a bit bored too so we decided to go home. Back to collect our umbrellas and we were told we couldn't leave the house by the front door (we were literally stood next to it) and had to walk through the house to get out. 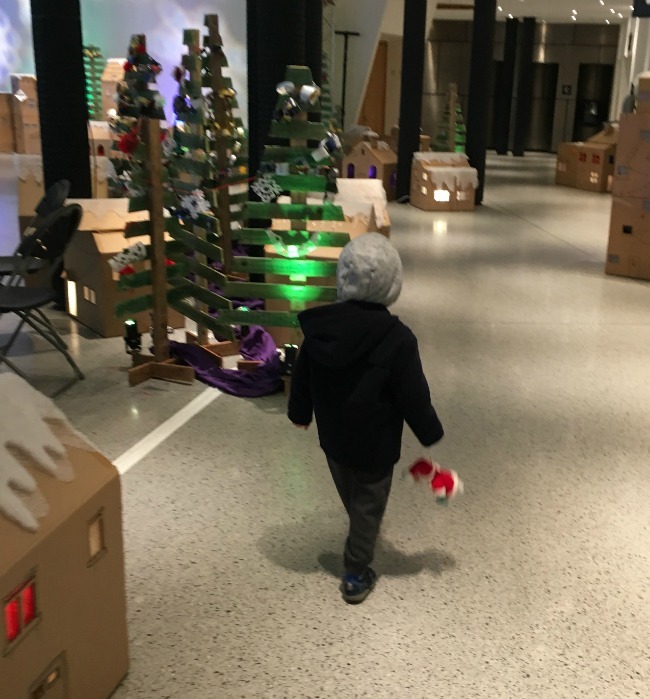 I had already done that walk five times and wasn't going to do it again with a child that wasn't cooperating so we just left by the front door anyway upsetting the Elf and Safety people. We tried driving a long way home so Bear could nap but he didn't. Lunch did make him a little happier and we gave him a bath too. He does have another cold so I am blaming it all on him not feeling well. We all have off days I guess but it's the constant "don't look at me" " don't talk to me" that gets me down. 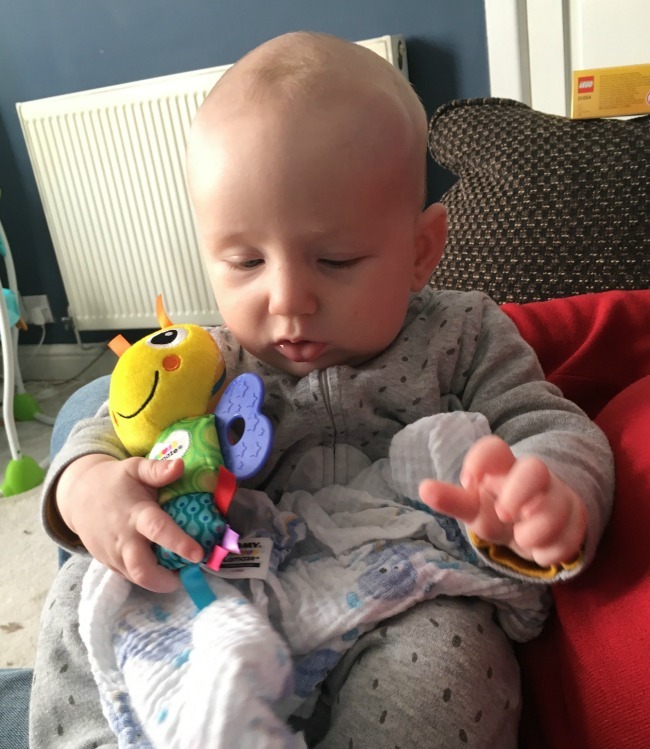 On Thursday we visited Bear at home and he went to speech therapy while I babysat Bee. Bears pronunciation is getting better, he is working so hard on his speech. Bee is really growing and is now four months old. 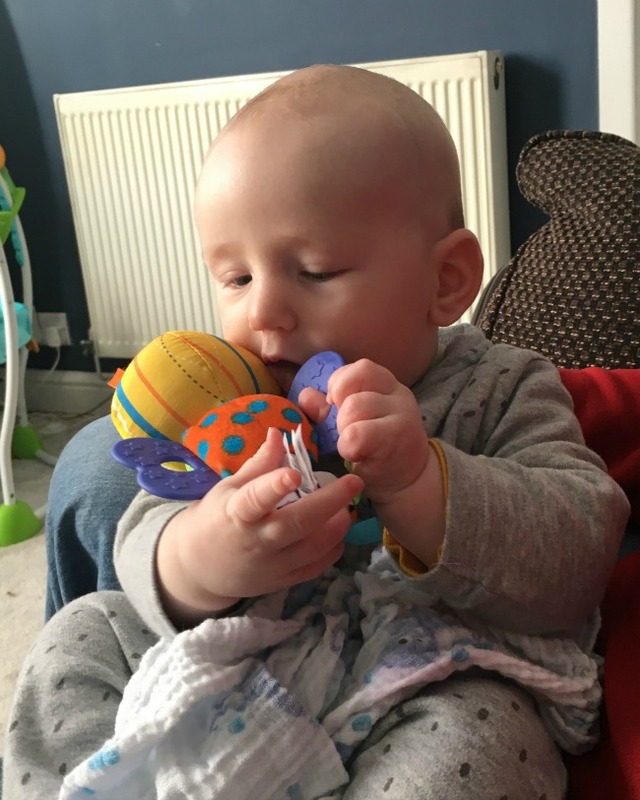 He is also trying to talk and blows raspberries. If you put him on the floor he tries to crawl. He is going to be a handful! 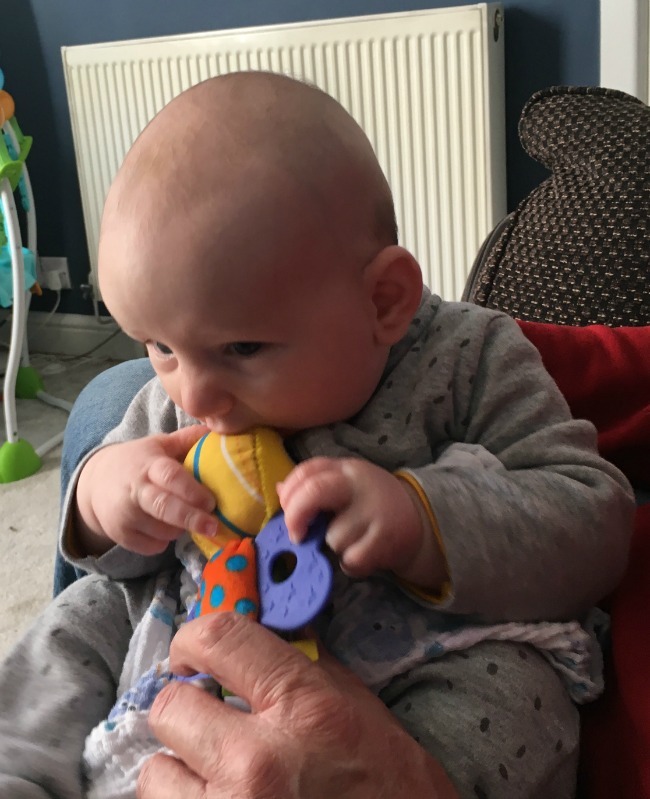 On Friday I babysat again while Grandad took Bear to nursery and mummy to a workshop about weaning a baby dairy free. Just to finish up, I learnt a lesson that I should know already. Never talk down to children, talk to them and if they do not understand then explain. We were walking through Cardiff Bay and carved into some paving slabs are fish, and other sea creatures. I was calling out their names when I hesitated and said "a shell". Bear corrected me "it's not a shell, it's a fossil Nanny, it's very, very old". That told me. Only another week until Christmas, I am nowhere near ready, I hope you all are.